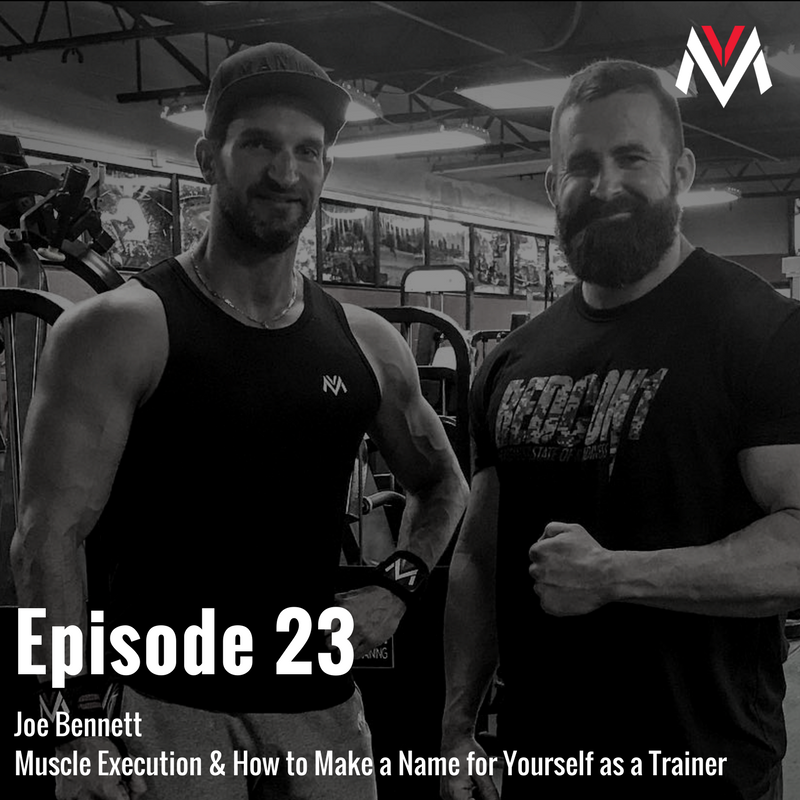 Hypertrophy coach, personal trainer, and pro bodybuilder, Joe Bennett, joins Vince on today’s show to discuss his training philosophy and his path to success as a trainer and coach. 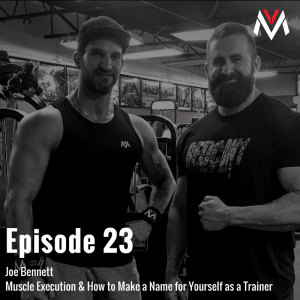 Vince and Joe get into a variety of topics, from Joe’s experience working with the late champion bodybuilder, Dallas ‘Big Country’ McCarver, and former pro wrestler and actor, Dave Bautista, to Joe’s take on the most common mistakes new trainers make with clients, to their top courses and certifications they recommend for up and coming trainers. It’s a show you definitely won’t want to miss! I can’t say enough good things about Vince! His story of his transformation from Skinny Vinny to where he is now is inspiring and made tangible through his coaching and training advice. His experience and wisdom in business and marketing becomes obvious immediately as well. Keep it up Vinny! Vince, thank you for being so inspiring to so many. You motivate me to want to constantly be improving myself for my wife, kids, and for my well-being also. I can’t thank you enough. Keep up the good work. Great content and super encouraging! Love the idea of the five M's! Lots to learn and super encouraging! I started following Vince back when he exploded in YouTube in the fitness space - Now i see that he has expended in the business and entrepreneurship! Great stuff man - keep up the momentum and keep on changing peoples lives! Look man I just want to thank you, I literally just discovered your podcast like 2 days ago and you have already helped me A TON as a guy who was on the fence and always un sure about wether I should try and do the fitness thing and follow my dreams, and always contemplating. your podcast is exactly what I need in my life right now. Thank you!! I listen to every episode. Immediately applicable content.Great job Vince. I've been following Vince since around 2010 when I gratuated from college and was looking for a reliable resource when transitioning from being a D1 athelete to strength training and body comp. I've always learned tremendously valuable information from Vince throughout the years (and his HMax program) and enjoy tuning into his newest videos/articles/podcast releases. However, I think what he is putting out there now transcends his past work and takes his value proposition to an entirely new level. His messages really resonate with me and I appreciate his honesty and openess as he shares his very human journey to maximizing his potential in all areas of life. He is definitely the role model I hope to be one day for others. These podcasts are terrific! I was very impressed with Vince’s no BS approach to the 5 m’s. Vince practices what he preaches. He incorporates his personal ethics and beliefs into his business and it shows in his success. As a married man with 3 daughters in my 40’s I have been encouraged in many occasions with practical no nonsense approach to 5 M’s. Want to 10x your online fitness business? This Podcast Is A MUST! I first started following Vince when I was completely out of shape. I was morbidly obese and Vince's content was a huge part of my fitness journey. After losing 125+ pounds, I made it a mission to help others do the same but I realized that this would be harder than I thought. After listening to this podcast, I realised the parallels between achieving fitness goals and life goals, including business, relationships and more (5Ms). This podcasts delivers so much value. If you want to 10x your life, you NEED to listen to this! The Mentor I prayed For! Vince has always been a mentor in the sense of building muscle since I first found out about skinny Vinny. But now as I have a family he has become much more than a training guru i looked up to. He is the definition of The Man I want to become. Although i have not been able to yet purchase his business coaching, i now have the mindset of “how can I afford this” instead of “I can’t afford this”. My mindset has been completely altered and I have learned so much in the past couple months from his Instagram and especially this podcast. It’s all about being resourceful when resources are low and finding a way to get what you really want in life. Implementing everything free he teaches has been so beneficial to my business and family goals. Vinny is the coach that I have prayed for, and god has put him in my sight again so that I can accomplish the 5 M’s of Manhood. Thank you for all the wisdom! I will continue to find a way to become part of his coaching programs! I've followed Vince's work for years and have a lot of respect for him as a fitness coach. But now seeing him evolve into so much more is very inspiring. Every episode just gets better and better. Listening to his podcasts will change the way you think about fitness, business, and life. Thanks Vince for doing what you do, you're helping a lot of people and it's much appreciated. I first heard of Vince probably 6 months ago and I heard about his podcast. I just felt like he was talking directly to me because all of his beliefs are what I feel. Him also being italian, he knows the values we carry in our households and the many challenges we face also. He was the skinny endurance runner just like myself. He just knows how to cut to the chase and tell you exactly what you need to do in order to succeed. I listen to his podcast on my morning commute and ride home from work. I just get the motivation to conquer the day and get more focused on my goals when life gets in the way. Love the M5 mission!! Vince is my fitness and business coach. Some of the best inspirations I’ve received from him have been listening to his podcasts while executing his training plans in the gym. So hop on the bike or treadmill and push “play” and see where it takes you! Vince and his guests provide some incredibly compelling content that’s geared to help you take actionable steps to live a healthier, more well-rounded life.Highly recommend listening and subscribing to The Vince Del Monte Podcast if you want the knowledge AND mindsets to improve your body, mind & spirit (and live your best life as a result)! Such a fantastic show! Right from the introduction of the show, I was intrigued by the podcast and had respect for Vince. This show hits on all the 5 M's and how to maximize them. A favorite interview of mine was with Lewis Howes about removing the mask. I love how open and transparent the interviews are. My big take aways : Are you going to the gym for attention or to be a 'real man' and build your strength, have no shame for taking the day off of weights, what is the true definition of a real man? the mask coming off effects the women ,and how in society, it's more acceptable for women to talk about their emotions. A great question to open up a conversation with a man: simply ask: "What's going well in your life right now? " Thank you for delivering a show that is full of integrity, respect and heart! Vince's podcast is a must listen for anyone who is serious about stepping up there game in life. I was introduced to Vince's material through Ben P after buying and doing the MI40 and then the 12 month Hypertrophy Max program. They were awesome. Thanks Vince for being willing to talk straight on your podcasts and be a leader where it's most important and useful!! You have really impressed me with the outstanding content. Please keep 'em coming! Vince has evolved and is helping others. I followed a couple of Vinces programs in the past and I thought after a while he was just a marketer and didn't have enough substance. The last few years with his new programs and especially now after listening to the podcast I can see him for what he is. Hes a great coach and hes not afraid to talk about his flaws and how he has evolved. He teaches lessons of what he's done right and what he's done wrong. Great podcast, great message to men and keep up the good work.Btw I don't leave reviews and listen to a lot of podcasts. I’ve listened to All of these to date. Both both very inspirational and practical. Thanks vince for being personal and real. Mindset is exceptional. I’ve forwarded to other friends. Good uplifting talks! Vinny’s authenticity and balance in life will inspire you not only in your fitness life, but all parts of life. So listen and receive motivation to take action. Thats what hearing Vinny has done for me in my life. Vince is the man! I love his approach to the 5 Ms and his overall goal to help men live happier, more fulfilled lives. This podcast is full of great conversations, great guests, and great perspective! #1 Podcast for fitness entrepreneurs and couples ? Are you a fitness enthusiast, a person who wants to grow, or just someone who’s looking for high quality entertainment? Either way - You have to check out this amazing podcast, which constantly gives practical tips & advice, easy to implement and the best: Vince is talking out of personal experience. It’s proven what he preaches! My husband and I are listening to this podcast together and we learn a lot about our relationship, about fitness topics and about how to life a life with intention. Keep it up Vince. We love your audio content! Love this series by Vinnie, followed him for a long time and love the insight he gives into all things business, fitness and relationships. Definitely worth a listen, it’s my favourite to listen too. The Vince Del Monte Podcast Show is a must listen for any man wishing to maximize the 5 M’s of life! He brings in the foremost experts on maximizing one’s muscle, mindset, money, mission, and marriage. I highly recommend The Vince Del Monte Podcast Show to all men! Vince says it like no one else...raw and real... and lives what he says.So blessed by this podcast today...gotta take massive action now...lifechanging stuff! Man, truly this is some of the most inspirational and forward progressing information you will consume.I have enjoyed every episode so far but what really hit home is the Power Couple episodes. I don't know how many times I have tried to convince my girlfriend to listen to Vince's stuff but when she finally gave it a chance, she LOVED IT.I envision my life excelling with the woman I am with and I feel like it was a life changing moment for her when she listened to the podcast.She's not much of a motivated individual - more of a homey "housewife" type, but a fire was lit when she listened and that alone gives me more hope in our relationship that we can go and thrive together. Thanks Vince, keep me coming! There are so many facts, and insights that he puts into these podcasts. He influenced my way of thinking, and my future way of thinking. It changes how I plan to run my future business (hopefully) and will influence my family. Back in the summer of 2016 I was invited to have dinner in Toronto with a couple other people to spend some time with our friend Jason who was visiting from Malta.One of those attending was to be a guy named Vince DelMonte. At the time I didn't know Vince personally, but since we lived in the same city, we decided to drive into Toronto together.Having read some of Vince's fitness content, I knew that we disagreed on at least a few things, but was hoping we could find some common ground. Frankly, he was also going to be my ride home so I didn't want him to make me ride back in the trunk. ?Anyway, it turned out that Vince and I shared many similar values and we chatted all the way to Toronto and back about fitness, faith, marriage, parenting, and a number of other things. I definitely picked up a few pearls of wisdom during our trip and I think Vince definitely added value to my life in that short time.I say all this to tell you that Vince has recently started a podcast called the Vince DelMonte Podcast Show. The focus of the podcast is about the 5 M's of Manhood - Muscle, Mindset, Money, Mission and Marriage. If you're a podcast listener and any or all of those areas interest you, then I'd highly recommend checking it out. If you want to transform your life, then you must listen to this podcast.Incredible knowledge and information on how to develop as a person in every area of your life.Thank you Vince for providing such valuable content. I have been following Vince for quite some time now and I have always found his material to be unique and inspiring. Up until now I have even been recording the audio from his YT videos so I can get my Vince Del Monte fix on-the-go or in the car. I am so happy that he has finally released a podcast, it's a great compliment to my MYM 2.0 monthly newsletter. With truly amazing, unique and honest material Vince inspires me to become a better version of myself everyday in all facets of life. I’ve just discovered Vince’s podcast and within just a few episodes I feel I’ve got more value than years of studying some of these subjects separately.Vince doesn’t hold anything back and shares what has worked in his life and what hasn’t. No matter where you are in your life you’ll find value. Vince covers topics such as entrepreneurship, manhood, Fitness, money, marriage and other topics to help transform our lives. If you’re a guy then just listen to one podcast and you’ll be hooked. Can’t wait to hear future episodes. I've followed Vince since his days on Youtube and he always has valuable information. I'm looking forward to new information I can utilize as I plan for my future in business and family. I've been following Vince for quite some time now I and this man is my idol. He's simple down to earth guy just like you and me but works so hard and loves what he does. He's an inspiration to so many guys. Vince I love the first couple episodes and can't wait for future ones! Definitely a fan of the marriage episodes the best because women are so confusing! Hi Vince,This podcast is really amazing. After hearing the podcast it really fires me up. More young man at my age should listen to this. Really teach me a lot of things that school does not teach. As a Father/husband like you is like a role model for me. Great podcast especially being so new! I've been following Vince since about 2007, maybe earlier I can't remember. He has always been awesome to listen to and has helped me in many different areas of my life. I'm really excited to get further into the series and learn more from a great role model! I’ve been following Vince for a few years. These podcasts are an excellent next step for me. Extremely focused and educational. He’s teaching on so many angles in life. Vince does it again. Not only does he talk about the M5 lifestyle he also promotes it by living it out. I really appreciate the honesty and genuineness Vince brings out in these podcasts by talking about subjects that aren't exactly easy to talk about and most fitness experts wouldn't want to get into. As a MYM2.0 member my highlight of the month is seeing my workout/coaching program in the mailbox every month and having these podcasts to listen too between each new phase is like the icing on a cake! Keep up the great work Vince! This is a must-listen podcast! I've been following Vince's work for several years now because I've always found him to speak from a place of honesty, passion, and experience. He's never been afraid to discuss the hard truth of life, admit where he's made mistakes, and strive to be and do more.There were several times while listening to Vince's podcast that I had to put it on pause because the wisdom he had just shared hit me like a ton of bricks. I actually needed a moment to absorb the information; it was that impactful, insightful, and inspirational.If you're serious about taking responsibility for your life's direction and becoming a better version of yourself, this podcast is a must-listen! I'll definitely be recommending it to family and friends. Amazing information. So motivating. Ready to take charge. I listen to quite a few different podcasts in the fitness and business space on my commute. I often find myself daydreaming and have to force myself to pay attention to what I'm listening to. With Vince, he presents information in such a charismatic and no bs way, that I found myself hanging on every word. It's almost like I'm listening to a big brother give me life lessons which makes it very relatable and makes me want to take action with those lessons. If you're looking for actionable advice on becoming a well rounded man, delivered in an easy to understand format, subscribe to this podcast. I've definitely got a new favorite! As a man in todays world of distractions It is so easy to become one dimensional. Their are ripped guys who are broke, Rich guys who are fat and getting divorced and ending up with broken families, Happilly married men who are doing well financially but are fat and in terrible health...The combinations play out in many scenarios and are all too common.Vince not only leads by example with the M5 brand, but also makes the podcast fun, informative, motivating, and easy to digest into actionable content. No matter where you are on your journey you will benefit from this podcast!If you want to to become a better man in all areas of life then this is a MUST listen/subscribe. Vince has already made me twice the man I was through watching “Live Large Tv”, so I’m very excited to see what he will share on his podcast. I love how he talks straight and doesn’t sugar coat anything and I love the honest insights into his marriage. Keep it up Vince! I have always enjoyed Vince’s content on YouTube and this show doesn’t disappoint. The sound quality is great and the content informative and easy to follow. I’m looking forward to more shows! This is truely an inspirational path in Vince's "No Nonsense" manner that speaks to your body, mind and spirit. This podcast is for every man who is ready to grow; who is ready to move their own ego out of the center of their life, to contribute to others in a posative way, start building something of significance from your life, and the same time continue to improve your physique. I’m hooked! When is the next episode? I have followed Vince over the years via facebook, youtube, and used his fitness programs. He is revolutionary in the industry, always searching for more information to make not only himself better, but anyone he comes into contact with better. This podcast is yet another example of him always trying to help others achieve their goals. He is not another cookie-cutter fitness coach, he is an inovator giving out not only excellent fitness advice, but actions to improve other aspects of your life as well. I’ve listened to Mindset and Money. Both both very inspirational and practical. Thanks vince for being personal and real. Mindset is exceptional. I’ve forwarded to other friends. Good uplifting talks! Truly inspirational! Vince DelMonte had taken his no nonsense approach to bodybuilding and has applied it to the 5 M’s of manhood. It’s this no BS approach that makes you think about your choices and how you as an individual approach life. For his target audience, 25-35 year olds, this is great information, take risks, make decisions and just get things done! For us older in years, this is nothing I have not heard before, but serves as a reminder and a wake up call to look forward and it’s not to late to change your life by maximizing the 5 M’s! It definitely has my mind going into overdrive on how I can change my future! A must listen for anyone wanting to move forward. Well done! A lot of great information in these podcasts. The one on mindset has me ready to take massive action! A good leader not only knows the way but also shows it to others and this is Vince Del Monte showing you the way to a better version of yourself, becoming a leader and dominating every area of your life. If you are on your path to greatness, then this podcast is an absolute must for you. Do yourself a favor, subscribe, listen and get ready to take some serious notes! Subscribed, and flying through the episodes!This is a perfect addition to the amazing content Vince already puts out. If you follow him, start listening, if not, start here and it'll make you want to check out his other stuff.I only have a select few podcasts I listen to, and this is now on the list. I struggle with time to read a lot, so audio books and podcasts are a god send. Get used to listening while driving, doing the house work, walking the dog.I already love Vince's work, I already listen to podcasts and audio books, so I know this is quality worth my time. But the best part of the review doesn't come from me, I normally listen to all this when I'm on my own, my partner prefers a book. But I put an episode on in the car, and she enjoyed it! Now that's worth 10x anything postive I can say 😉Don't miss out! I've known Vince for over 5 years now, and from already binging a few episodes of this podcast, I'm AMPED and excited to listen on a weekly/even daily basis! Vince's vision for helping men grow in all 5 of these areas is something I've really respected over the time that I've known him and it aligns perfectly with his already HUGE fitness audience. No one out there right now is providing valuable content like this, broken down in easy to understand segments that can be applied literally right away. I will be sharing this podcast among all of my platforms and HIGHLY recommend it to any man who is looking to master the 5 M's! Vince you're the man! Every man need to listen to this podcast. Great work Vince! Loved every episode. Listened to them all in one sitting. Bring on the next 5!! I've followed Vince for years and he has always delivered the very best. And his podcast now just adds to the ways he is making men better for this world. He has years or wisdom and experience and the lessons he teaches in this podcast will save you time, money, and frustration. Listen well, and listen often. There are a lot of people out there telling you what they think you should do to get results in your life.The best thing about this podcast and Vince is that he is totally upfront about everything. He just says what’s on his mind regardless of what you might think, especially when it has anything to do with his faith. This is actually the reason I have been following Vince for the last several years.Personally as a newlywed I am interested to know more about the marriage “pillar” in his 5Ms. But honestly it doesn’t matter what Vince is talking about you will always learn something when listening to this podcast. What a great addition to the MYM 2.0 newsletter. Great content as usual with Vince and has honestly turned my life around. Can’t Thank you enough For anyone contemplating signing up... DO IT !!!! Vince walks the walk. He’s one of the few guys who’s credible in all 5 M’s of manhood. There’s tons of popular figures who do “money” well and lack in their “marriage.” Or do “mindset” like no-other but are missing the “muscle.” Vince has figured it out. And it gives us men who want to do well in ALL areas of our life, hope that we can do it too… and action-steps to make it a reality. Nowadays, its' impossible to find authentic, creative and unique individuals in the fitness industry that provide value and substance. Vince has been a trend setter with his online fitness programs, nutrition and supplement expertise for close to a decade. His no non sense approach is backed by research and real world results. It's only fitting that Vince shares his success stories on the 5 M's of Manhood through his podcast with all of us. These are the same values he's mastered, creating 'The Gold Standard' in fitness prosperity. Vinny is exactly the same person he is online as he's portrayed on this podcast. He practices what he preaches. I've been following Vinny for about 7 years and this year, I joined his Coaching group. There's so much negativity online these days and listening to this podcast is like sitting down with Vinny for coffee and having him help Coach you, for free. Excellent work, Vince! Definitely one of my favourite podcasts. I used to follow Vince for just his fitness advice but his podcast is off the hook. His marriage and money advice is spot on and this podcast is going to make me grow into a better man. Love the idea of the 5 M’s. super smart. Men need to win. What few of us realize is that we define victory, but we're so influenced by media, by the wrong people, by movies and even friends and family, that we too often pursue the wrong thing, or something that's not worthy of what we should be aspiring to become.Find better influences, better voices to listen to, better leaders to guide you, like Vince.Vince's podcasts have really helped me find clarity on the 'who' - who I need to become - so I can acheive the 'what' - what I want to acheive in life, but they've also helped me better define what I want, and bring it to a much bigger scale.The mindset episode is my favorite, but each will help men win, and win a game they didn't even know they could play, on a scale they never thought possible.Highly recommended to any ambitious guy, any guy who wants more from life. If you're content with mediocrity, with an 'okay' life, it won't be your cup of tea. I have only listened to the first 2 episodes so far but really enjoying the no nonsense way that Vince presents his topics and strategies. I'm looking forward to finishing up the M's and see what is next. Keep 'em coming Vince!! Honestly, I've listened to a several different fitness / personal transformation kind of podcasts, this is probably my new favorite. I didn't know much about Vince and his work until I listened to the podcast, but it's the best of everything: incredible actionable information about how to build a physique (the right way), really good insights about everything from making money to attracting a romantic partner, and deep dives into mental game and having the right mindset. You can tell this guy is a great coach; fantastic for personal development and motivation. I like the conversational approach, and he has an inspirational way of communicating. Looking forward to hearing further episodes that expand more into the 5M's. The change in my mental outlook and preperation was pretty instantaneous after listening, and I generally don't have that experience with other podcasts. Highly recommended. I was skeptical at first but after listening to the money episode Vince really does a good job of pointing out simple strategies and proven ways to better yourself as a man not only in finances but health,fitness,relationships and mindset. The good part is you the stories and provide tactical stuff you can actually apply to your life today which is sometimes hard to find. The article is clear, point by point and cautious! I had a huge amount of gather in the wake of watching this article from you! I believe that its interesting, your article gave me another perspective! I have examined various diverse articles on a comparative subject, yet your article influenced me! I really appreciate films like this one and the content is so great. They share a ton of motion pictures which is from Hollywood and Bollywood and different spots. I am glad you put firmly in what you structure. This makes you stand way out from different clear stars that push deficiently made substance. A personal trainer always the best pick for if he or she has experience in the field. I also hire a trainer then I learn from it. After that, I do it on myself. With great trainer there will be a change in body. Fitness is must. Thanks for the given this amazing article i must be like to visit here you have to seen here how to fix battery icon missing from taskbar commend for knowing very useful to web user for save power easily.